Whenever you run, walk or stand, your feet form the foundation of your body. 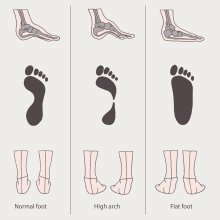 Sometimes, though, the shape of your foot or an injury can affect the angle at which your foot strikes the ground. If severe enough, this can cause pain in the foot, as well as in the legs, low back and other areas of the body. Because of the importance of the feet in our lives, stabilizing them is an important part of chiropractic care. If you have an imbalance in your feet, your chiropractor may suggest orthotics. These customized shoe inserts can reduce symptoms and improve your walking and running without the need for treatments like surgery. Orthotics change the angle at which the foot strikes the ground. They can also absorb some of the impact when you walk or run, improve your balance and shift pressure from sore parts of the foot. One type of orthotics is used for people with soft tissue problems, such as diabetes. These shoe inserts can reduce the pressure on areas of the feet where ulcers (open sores) may occur. This may reduce the need for amputation. The other type of orthotics is designed to improve how the foot strikes the ground. They basically work by bringing the ground up to the foot. These can also be used to treat conditions such as tendinitis and shin splints. For example, people whose ankle rolls inward as they walk or run — pronation — may be given orthotics to keep their foot, ankle and leg in alignment. This can reduce pain in the feet, knees and hips. It may also reduce the wear and tear on the joints. Over-the-counter shoe inserts are available at pharmacies and sports or shoe stores. In many cases, these will work fine. For more serious foot conditions, a customized orthotic can work better. These are shaped specifically to fit your foot. They are also made of stronger materials and will last longer. To fit your orthotics, your chiropractor will examine your feet and watch you walk. He or she will also ask you about symptoms that you might be having, such as pain in the foot or legs, and whether you have any health conditions such as diabetes. If your chiropractor decides that orthotics are a good option for you, he or she will take a three-dimensional picture of your foot or use a mold to create a replica of your foot shape. These will be used to create an orthotic that is designed to improve your comfort and mobility. If you are experiencing pain your feet or legs, ask your chiropractor whether orthotics might be a good fit for you.